Oh yes…chocolate chip dough balls…finally! 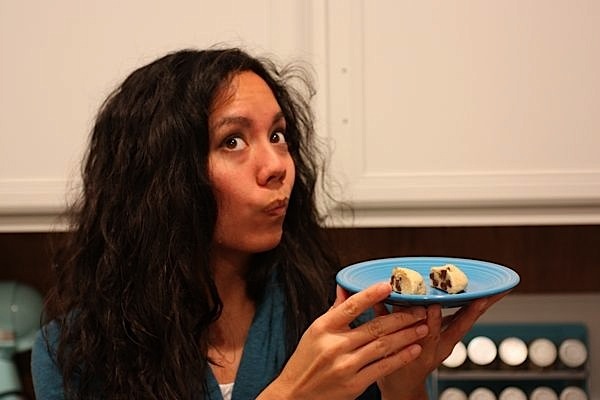 7 batches later, I finally have a chocolate chip cookie dough ball recipe to share with you guys! …back at the Foodbuzz Festival a couple weeks ago (wow, has it already been that long? 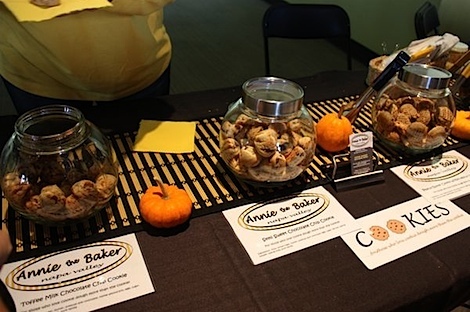 ), the buzz of the tasting pavilion was Annie the Baker’s dough balls. I had two. They were amazing. I knew as soon as I tasted them that I just had to try to re-create them at home. On Monday, I was too jet-lagged to be creative, but on Tuesday, I attempted my first batch. Little did I know that on the other side of the country at (possibly) the same time, Mama Pea was working diligently on a vegan version of dough balls in a peanut butter flavor. Her balls came out beautiful and perfect. But, you guys know me…I like a good challenge. And, I would NOT let these dough balls get the best of me. So, I modified my recipe and tried…and tried…and tried again. As I mentioned earlier, my second batch more resembled dog treats than human treats. I tweaked the draft recipe and while my third and fourth were pretty good, but didn’t have the right texture (though they were at least no longer flat). My fifth made for a delicious regular chocolate chip cookie, but once again, they were flatter than they were supposed to be (though not nearly as flat as the dreaded batch #1). 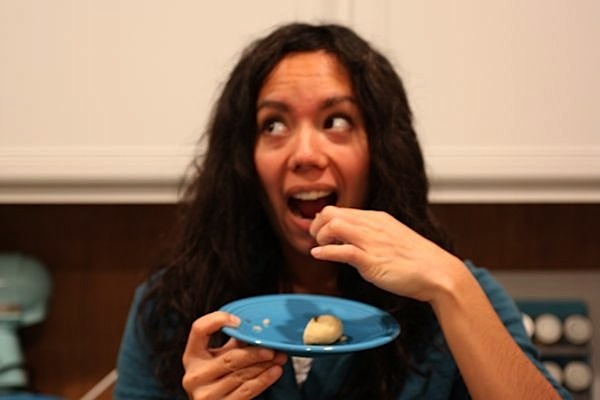 I tried various trial versions of the dough balls and made hubby do a taste test. He thought they all tasted really good. 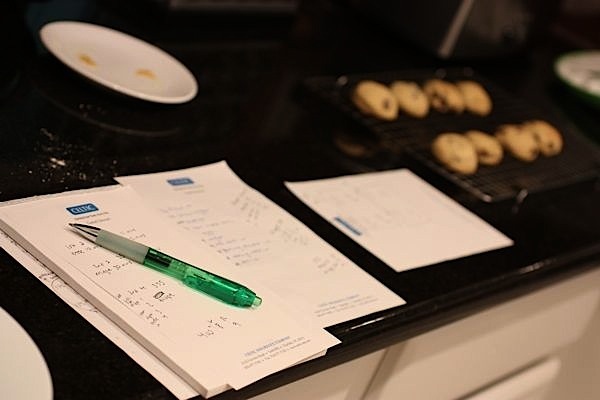 Notes on baking times and modifications. A strange collection of dough balls baked from frozen, refrigerated, and at 350, 375, and 400 degrees F.
Which version will taste the best? Only a taste test would tell. I liked the version that was refrigerated and baked at 350 best. So, here we are at lucky batch #7. See below for full recipe, but here are some photos to help. The wet just before stirring into the dry. It will look like there is entirely too much flour and not enough dry. 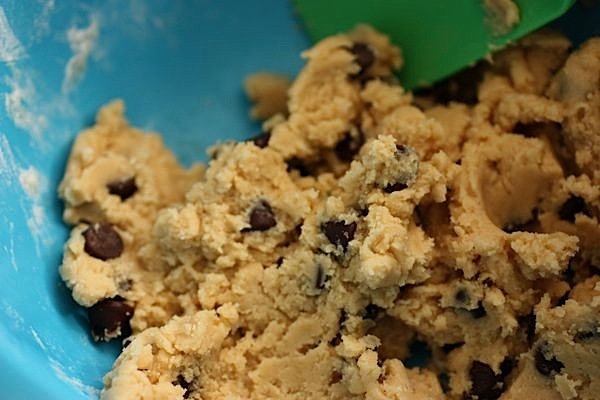 You may think you’ll never be able to get cookie dough out of this desert of a bowl, but keep working the dough. Trust me. 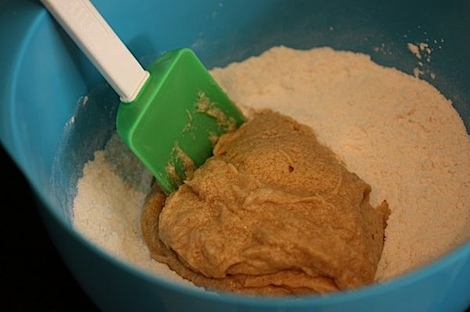 Just press the wet dough back into the dry parts, using the back of the spatula. Try to not over-mix, though. Add in chocolate chips and Boom! You have chocolate chip cookie dough. Now, you won’t actually want to eat this dough. Since it has raw egg in it (unless you use a flaxseed egg, and trust me, I will be testing that version of the recipe out sooner than later to ensure it works), you can’t safely eat it until it reaches 160 degrees F, according to various web sites. First you’ll want to chill the dough a bit. You could probably skip the refrigeration step, but your dough balls may be a little more flat and cooked through in the center. 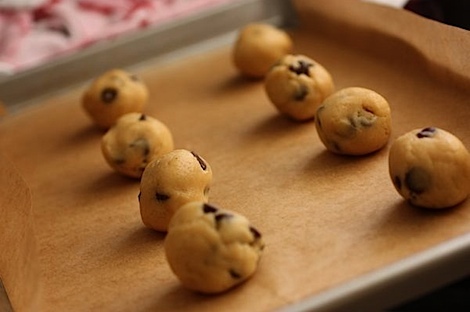 Use a small scooper to scoop out same-sized balls of dough. I think this is either a melon baller or a sorbet scoop. Use the one that is smaller than an ice cream scoop. The one with the little sweeper button will make this process a bit easier for you. You can try skipping the ball rolling step, but since the balls will flatten out a bit during baking, I find it best to try to get them as “tall” as possible so they stay more ball-shaped throughout the cooking. Bake and you should have perfect little dough balls. You’ll want to look for very light browning on the raised area of the dough balls. 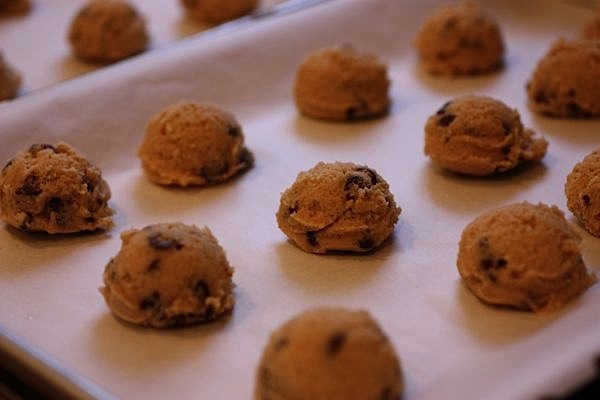 For the most part, they may look like raw cookie dough when you remove them, but you don’t want to cook these too long or you’ll just have tall cookies and not dough balls. Likewise, you don’t want to undercook these because of the eggs. I used a meat thermometer to ensure the centers of my dough balls were over 160 degrees F to be safe. The bottoms will be lightly browned. Note cooked outside edge and tender inside. That’s pretty much what you’re looking for. But, you can cook your balls a minute or two longer if you want your center a bit more set, like this. In a medium bowl, mix sugars and butter till creamy. (I used a handheld mixer, but you could probably just use a whisk). Add egg and vanilla and mix till combined. Mix wet into the dry. Note: it will appear there is not enough liquid for the amount of dry ingredients, but continue mixing. It will form into a dough, it will just be a firm dough. See tips above for combining. Careful to not overmix. Use a small sorbet scoop (about 1″ wide) to scoop out dough into small mounds. Note: In this method, I don’t roll the dough into balls, I just scoop straight to the baking sheet. 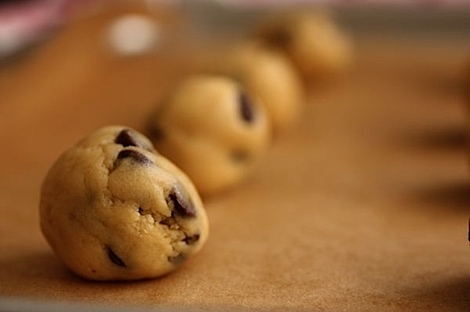 Try to not let dough touch too closely so they don’t freeze together. Freeze for at least 30 minutes, though 1 hour is better if you can wait that long. See Notes below for tips on baking/freezing. When you’re ready for some sweet and delicious dough balls, pre-heat your oven to 400 degrees F. Bake balls for 8-10 minutes, depending on how set you want your centers (I find mine are perfect at 9 if the oven is well pre-heated). I usually consider mine done when the tips of the dough are lightly brown. If you use egg, and you’re paranoid like me, you can use a meat thermometer to ensure the centers of the balls are at least 160 degrees F, which many web sites say is the safe temp to eat eggs. Let your dough balls cool till they’re save to eat and enjoy! Refrigerate dough for at least 20 minutes before using a small sorbet scoop to scoop out dough into small mounds. Roll each mound into a ball and spread evenly on a baking sheet, leaving roughly 2-3 inches between each ball. Bake balls for 10-14 minutes, depending on how set you want your centers. If you use egg, and you’re paranoid like me, you can use a meat thermometer to ensure the centers of the balls are at least 160 degrees F, which many web sites say is the safe temp to eat eggs. 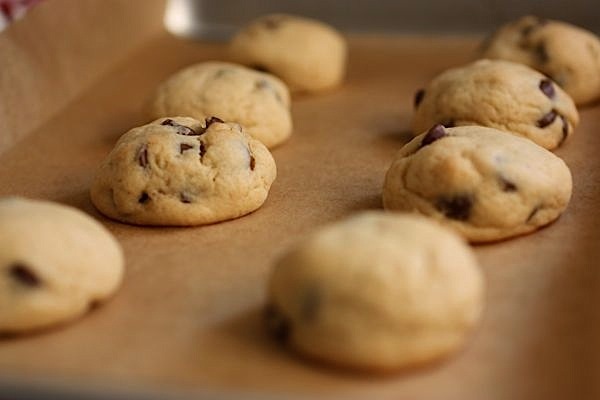 Let your dough balls rest on the baking sheet to cool at least 5-10 minutes or until they’re safe to eat. Enjoy! 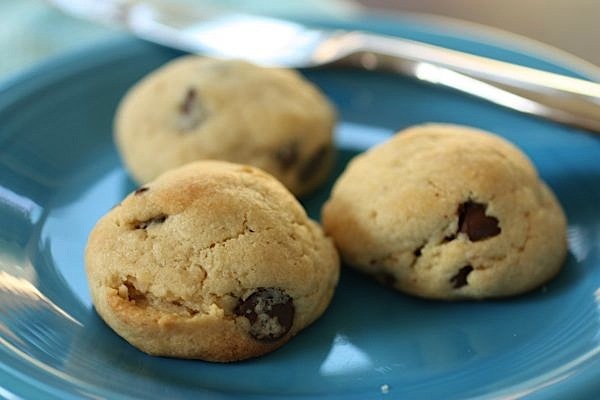 I almost always make a double batch of these, especially using the “Scoop and Freeze” method. I like to freeze the scooped dough balls on a baking sheet for at least an hour to overnight before moving them to a flat tupperware container. This way, you have dough balls ready to bake whenever you’re ready to eat them! This is my favorite dough ball flavor, but the sugar cookie version is a close second! I’m hoping to try out some other flavors I’ve been dreaming about (I’m thinking of mixing in oatmeal and almond paste! ), but be sure to check out Mama Pea’s scrumptious Peanut Butter Cookie Dough Balls for another wonderful flavor option and a vegan version. What’s the most times you’ve tried making a recipe? Did you ever get it right? I have been waiting for this recipe since all of you Foodbuzz goers posted pics a couple weeks ago! Thank you for doing all of the hard work of figuring out a great recipe! I’m going to make them tomorrow, and I’ll come back to let you know how they turned out for me! Thanks again! 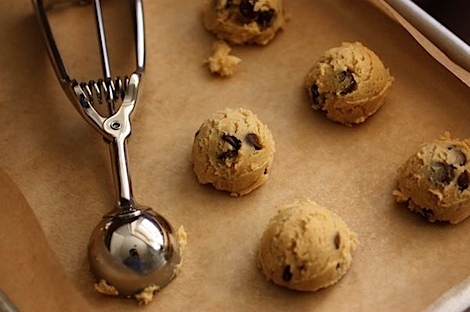 yumyum!i love cookie dough.. these look so chewy and gooey and perfect! YESS I can’t wait to try these! So would you recommend NOT using my kitchen-aid bc I’ll over mix that way? Your determination and persistence is incredible! After one bad batch of something, I lower my head in shame and avoid the kitchen for a few days until I get over it. lol…awwwww. Not sure if it’s persistence or just stubborness! 😆 Thank you! In all seriousness, I think this is a great idea. 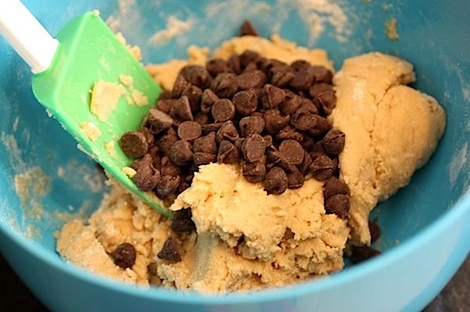 I mean, how many people LOVE to eat cookie dough? This combines the best of both worlds. This is baking season, right??? I think that’s Annie’s slogan – something like – for people who like cookie dough better than cookies. She’s brilliant! I have been looking for a version that didn’t have PB – thanks for posting this! 🙂 I will give the flax egg version a try! Oh wow! these look really good! I can’t wait to try this. I want to try Snickerdoodle dough balls. Doesn’t that sound good? Thanks for the recipe they look amazing and the ingredients seem pretty simple. Yum, these look great! Thanks for doing so many trials to get the perfect match for Annie’s dough balls 🙂 Can’t wait to try out the recipe! they look so good!! yum! These look amazing! Great things happen through all that sweat and tears! 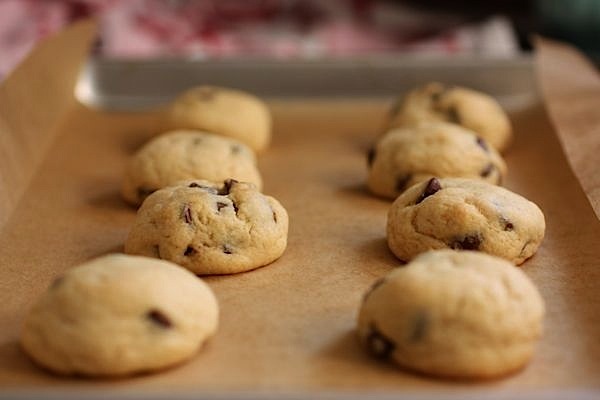 Oh my, I’m pretty sure I need to go make these….right now! I made these yesterday and tried to de-veganize them. I did ok but planned to keep trying. Next time it’s your recipe all the way! After hearing so much about the infamous cookie dough balls, I’m excited to have finally found a non-PB version. I might just try them right now. But…I do have a weird request: could you email me the recipe for the failed first attempt? I love the looks of the pics you posted. 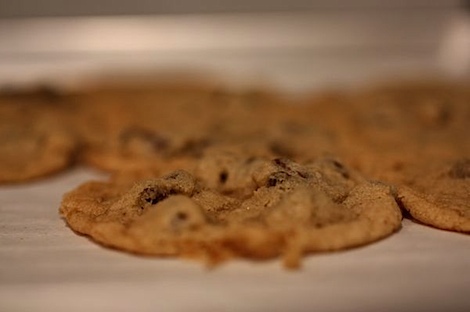 I know – I’m weird, but I love a good flat cookie, as long as it is really soft and chewy. Those pics remind of of a total cookie failure I made many years ago that turned into a happy accident when I made chocolate chip cookie bowls and then used then for ice cream sundaes. I’d love to lood at attempt #1 and try it out! Ahhhh! 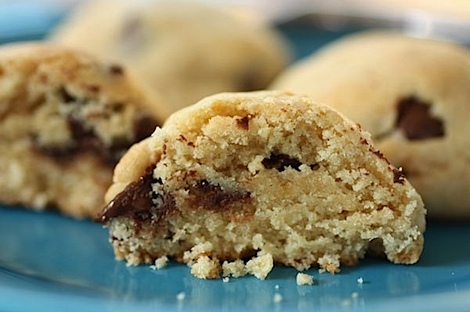 I’ve been waiting for a peanut butter-less, chocolate chip version of these! Thank you so much for having the patience to go through the trial and error of seven batches. 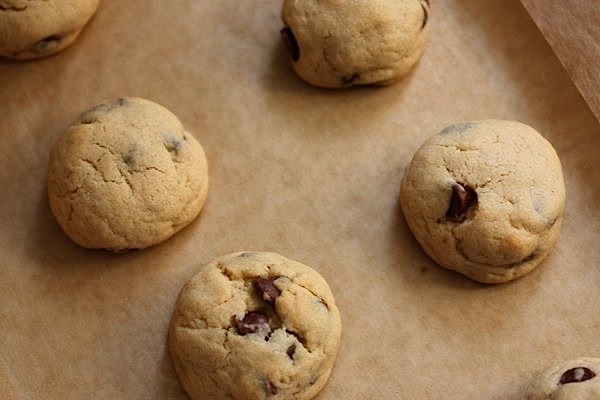 I really appreciate your mad recipe-tweaking skillz, and I’m so excited to make these tomorrow. Thanks again! These look too good! I love all of your blue kitchen appliances! Yesyesyes!! Thank you for going through 7 batches to perfect this recipe Diana. Your efforts are worth it! I’m happy there is a non-vegan version out there now too, because now I don’t have to buy vegan margarine to try it 😛 These are happening in my kitchen sometime this week – I’ll report back on how it goes! Yes!!!! I have all the ingredients for these at home!!!! I am making them tonight! I cannot believe I passed over the dough balls at the tasting pavilion!!! What was I thinking!? I just made a gluten free snickerdoodle version of these and I will post on them tomorrow. Between my three boys…they lasted an hour in the house! While I did not go to Foodbuzz (so I have no frame of reference), I would say this is a winner! Thanks for the recipe! 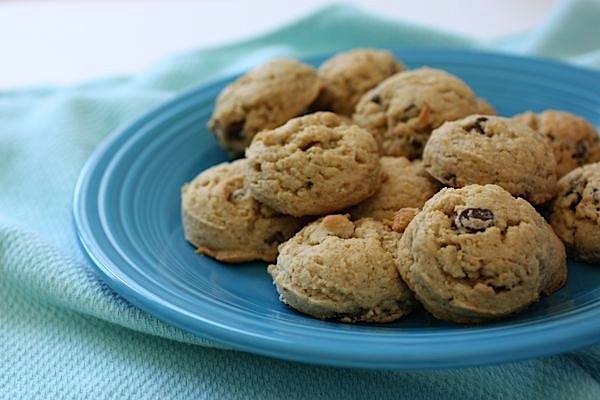 I tried making these but modified it by replacing the chocolate chips with walnuts and adding oats. Turned out pretty good! I am going to figure out a way to make sugar cookie dough balls and maybe even decorate them a bit, for the Holidays… fun! I made these tonight – I nixed the chocolate chips and added oats and cinnamon. I also rolled them in a cinnamon sugar mix before baking. They turned out great. I’ll put ’em up on my blog this week. In my excitement I forgot to thank you for the recipe to play with in the first place. So, thank you! 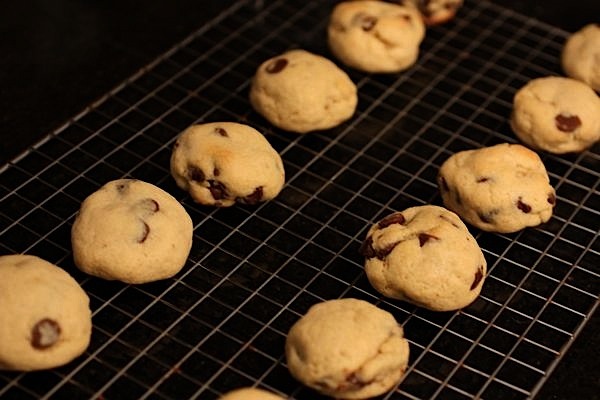 I made these last night, and while they were tasty…they were very dry and crumbly, and I even baked them for slightly under 10 minutes…. Hmm…not sure why. Did you use the proper portions of wet ingredients for the butter, brown sugar, granulated sugar and eggs? I wonder if maybe you didn’t mix them enough? 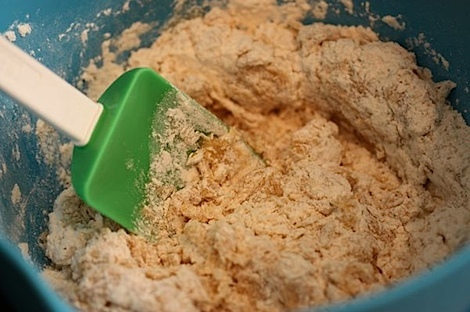 The flour should be incorporated fully into the wet. Hmm. Does any one have any ideas? I measured everything out correctly and the batter looked really good, so I don’t think it was that. I did however have to make my own baking powder by using baking soda+cream of tartar, but I doubt that variance would change the texture that much…. I tried your recipe the other night. Are they supposed to taste like raw dough? I love raw cookie dough but the taste kinda made me sick to my stomach. The bottoms were browned lightly. 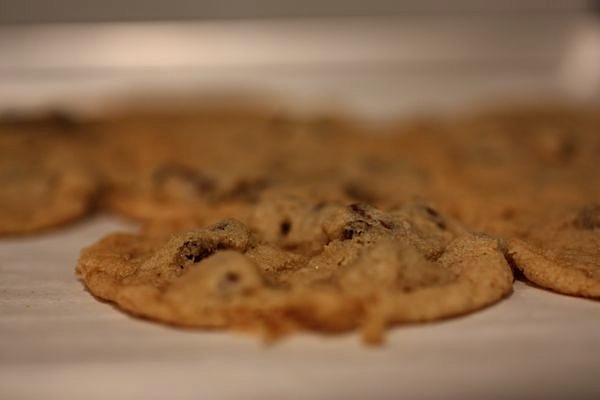 Did your batch taste too doughy or just like a soft cookie? Way to stick with it! These look absolutely amazing! Excellent, thanks for the tip! You’re welcome! 🙂 Happy baking! What’s the recipe for batch #1? They look delicious! I made these tonight with a flax egg instead of a real egg. They turned out great! The last time I made them (using mama pea’s recipe) I didn’t soften the butter like I should have and they were crumbly. I think the proper softening is really important. Made these tonight! Delicious. I have already had about five. Thanks for the recipe! PS Is your name really Juliet because that would be awesome. I used to be really into Romeo and Juliet when I was in high school. I’m still a big fan and think Juliet is such a pretty name! I took a whole bunch to work yesterday and they were a huge hit! After handing them out to several co-workers I put the extras in the kitchen and they were devoured in about 2 seconds. So thank you for the recipe!! I going to make these for Thanksgiving! I hope they turn out as good as yours! so easy! so delicious! thanks for all of your hard work creating & sharing these! 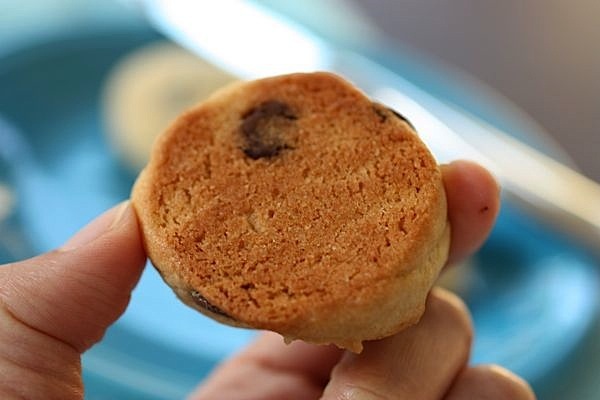 I made these and followed everything exactly except I used Smart Balance margarine and they turned out pretty dry and crumbly- not doughy at all! I baked them for 11 minutes…could my butter sub have been the problem? I’ve never used Smart Balance and don’t know what it’s made of. I used whipped earth balance to make the dough balls and they turned out perfect. It’s possible. 🙁 Did you soften the margarine before mixing? Also, I sent out a tweet to my twitter friends to see if anyone else has tried Smart Balance yet. I know a lot of people have used Earth Balance with success, so you could possibly try that? Wow! What determination you have! 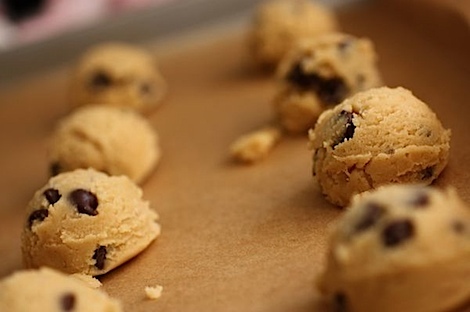 About how many cookies did the recipe yield for you? I admire your perseverance… Looks like it paid off! 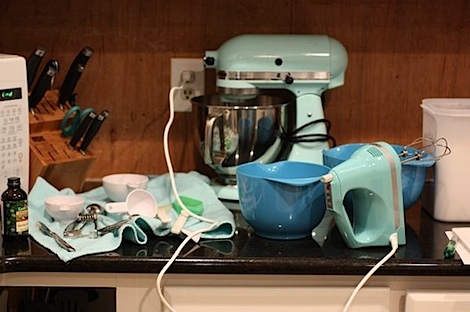 I love your light blue stand mixer hanging out in the back! I’ve been looking into buying one! How do you like it? these looks just like the chinese peanut cookies! Thank you,thank you for sharing your recipe! I cannot wait to try this soon. The texture was absolutely perfect but mine were not sweet at all! My husband asked “is this bread or a cookie?” I read and re-read the amount of sugar a zillion times. Did anyone else have this issue? Afraid if I just dump in more sugar I will mess up the texture. @Jennifer – I just made them last night and had the same issue! Have you tried to re-create them? It needs more sugar for sure, but I’m also afraid to mess up the texture. Anyone have any advice or suggestions? Adding too much sugar or butter may make them flatten out. I actually like it when cookies aren’t too sweet, so I may have been a little light-handed on the sugar on purpose. Whoops! 🙂 I would suggest adding sweet mixins, or possibly rolling the balls in sugar to add extra sweetness without changing the texture. Happy baking! 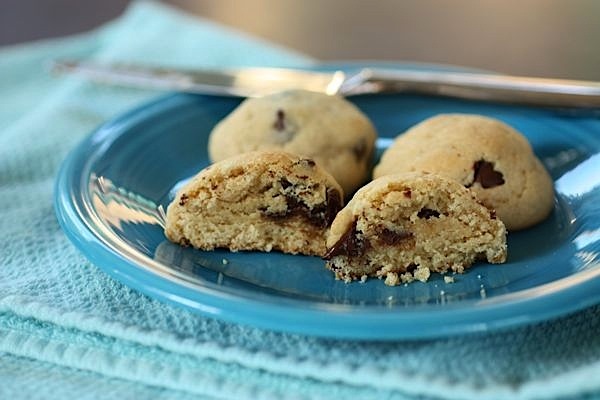 I dipped mine in chocolate almond bark…having a less sweet cookie made it perfect! I (finally) made these last night and OMG! They were perfect little balls of heaven! I will definetly be making these again! You are a goddess. These turned out beautifully! 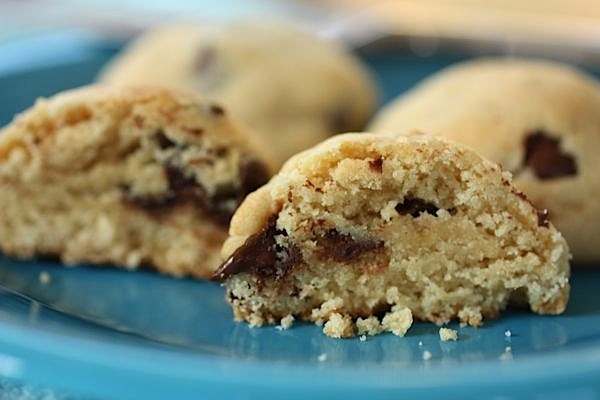 I’m catching on late… I just made these and they are absolutely heavenly!! The texture was perfect.. I was so tempted to add a tbsp of milk to the mixture and I’m so glad I listened! 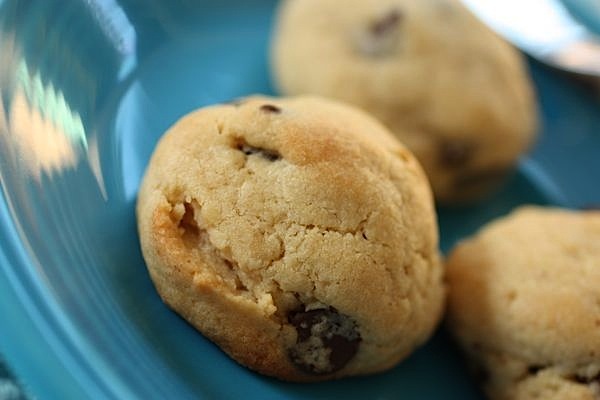 I was reading some of the comments regarding the sweetness of the cookies… maybe using more regular sugar in place of brown sugar will make the cookies sweeter? I did 1/4 cup brown sugar 1/4 cup regular sugar and a tbsp of brown sugar. Thank you. I’m building the tower to take to my office bake off!! I literally just made these, and they are AMAZING! So glad I found this, and that you made them of course. Thank you so much for sharing! I made these today for a party tonight along with a peanut butter version of the butterscotch ones. They are so tasty I am not sure if they will all make it to the party ;). I wanted to post a note because I substituted in wholewheat unbleached flour on both recipes, and I used chia seeds+water in place of the eggs. They turned out beautifully. Thank you so much for the all the hard work on getting this recipe together. I will be making these again soon! After hearing about these amazing balls, but knowing I’d never be able to buy them, as I live in Australia, I knew I had to make them one day. And then you posted your trials! Amazing!! I made them today – SUCESS. Good news is they work down-under too!! And even if your egg is a double yolked egg (I didnt pour it into the glass first – thats the last time I try to rush my baking) – they just end cracking (maybe I overbaked?!) Sounds like it might be a little forgiving, so I might try experimenting with flavours/health later. I found them sweet enough and I am a sweet tooth. I am not very accurate so maybe I added a tbsp more of the brown sugar, but they retained their shape. OMG…I want to eat the whole tray…and they were bigger than I wanted. I need a melon baller. Awesomeness! Just tried these with a flax/chia egg (i did mixture of flax and chia – the flax wasn’t getting very gelatonous on its own) and the dough tasted AWESOME and the cooked dough balls turned out great too!! I love how it uses a flaxseed-egg. Awesome! I made these once a month or so and devoured the whole batch in two days with a little help from my husband (who usually hates sweets). YUMMY!!! They are so pretty! ! ! ! ! ! ! Hey Diana- Thanks for all your hard work in coming up with this recipe! I’ve had it bookmarked for months and FINALLY got around to making these. They turned out fabulous! I thought they were perfectly sweet– and that’s coming from someone who adores over-the-top sweet things, too! I’m going to have a hard time NOT eating all of these in the next two days. Just wondering– did you end up with 16 cookies, too? That’s how many I made using a 1″ baller. Whitney – you’re so welcome! I’m so glad to hear they turned out well for you and that you thought they were just sweet enough. You know, for all the times I’ve made these, I always forget to count! lol I think 16 sounds about right to me, though. Oh my goodness – Isaac and I just ate the dough balls you gave me and they are delicious. Probably one of the best chocolate chips cookies I’ve had. I’m definitely going to try out your recipe for the next party I go to. Yikes! Just realized I didn’t reply to this – so sorry for the delay! OMG. The dough balls this weekend were sooooo good. I really need to make these again soon because I am drooling over these photos. Thank you for bringing them to HLS, it was a delicious treat! Sorry for the delayed response, but this is so awesome to hear! I’m so glad you liked the dough balls, and from the photos, it looks like they turned out perfectly! Good luck with the new(ish) house! These look amazing! Am definitely going to have to try them…soon! Thanks so much for sharing! These are AWESOME!!! Literally like eating a ball of cookie dough. I’m addicted. I followed your recipe exactly but made it gluten-free and vegan by subbing Bob’s Red Mill gluten free flour mix, a splash of xanthan gum, Earth Balance buttery spread and a flaxseed egg. They came out PERFECTLY!!! Thanks for the new obsession! Thank you for checking out my recipe! 🙂 Glad you liked them! Thanks for doing all these trials! I would not have the patience but I’m glad you did, these turned out great. Hey Laura, you’re so welcome. It was frustrating at times, but overall, I had fun doing it. I’m glad to hear they turned out well for you! 🙂 Have a great week! “If at first you don’t succeed, try, try, again!” You totally took that to heart, great job! They came out beautiful! 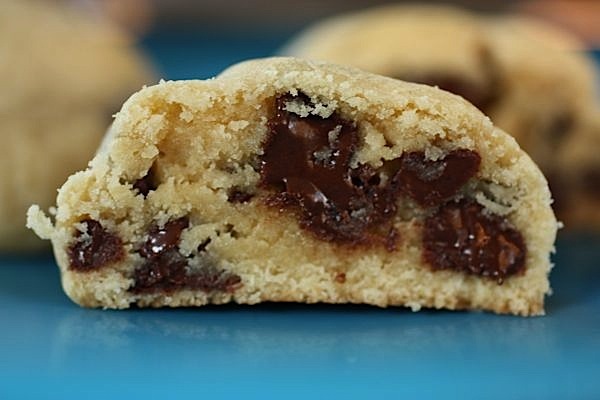 Can’t wait to try this out for myself; think I’ll make them for hubby for Valentine’s Day. :) Thanks for the inspiration! Thanks for adding all the mid-process photos. After years of fairly proficient baking, it’s still hard to gauge when something’s really done. Good to have some new parameters to consider! HI, I just saw Annie the Baker on Cooking Channel and she said she freezes the cookie balls before baking to keep the shape and cooks them at a “very” high temperature. I’m planning on making these tomorrow–but I just want to clarify: is it 3/4 of a stick of butter or 3/4 cup?? Thanks! Excellent! 🙂 It’s 3/4 a stick. I think it works out to some weird measurement, so it was easier to just use the stick as the measurement. lol. Happy baking! I made these chocolate chip cuties tonight and they are fantastic!! Thanks for the best choc chip cookie recipe I’ve ever tried!! Hi Diana!! I know I am a bit late to this post/receipe, so I hope this message gets to you! It is just a few days away from Christmas and I decided to bake these little cute cookies for everyone. Everyone includes A LOT of people. What can I say? I have a HUGE immediate family. Anyway, I was wondering what the yield was for the receipe above. I just wanted to know how much, or an estimate of how much cookies will come from this batch. Hi again! I guess I was excited an spoke too soon about the yield. I see now its about 16…which is exactly how much I got out of the mix using a melon baller lol! Cookies were a HUGE SUCCESS!!! I am actually making more as we speak LOL. Hi Erin! You are too sweet! I’m so glad to hear the cookies were such a success. Woop! There’s a “Print” button with the recipe details. I’ve converted almost all of my recipes (at least the popular ones) to a print-friendly version. The button is just below the small photo that goes with the recipe (on the right side of the recipe details). Anywho, you definitely don’t owe me anything for the recipe. But I’m so happy you came back to comment and let me know you enjoyed the recipe. These are the things that keep me experimenting in my kitchen. 🙂 Merry Christmas! And Happy New Year! A few years too late haha thanks Google…No matter what recipe, mixing method, ingredient/dough temperature, or oven I use my chocolate chip cookies almost always turn out like your #7. It’s actually kind of annoying because I want them to be semi-flat with obvious chunks of chocolate in them. Oh well. Kudos to your saintly patience! !